FILE - A man watches a TV news program showing a file footage of North Korea's rocket launch at Seoul Railway Station in Seoul, South Korea, April 28, 2016. South Korean media reported Thursday that North Korea may be preparing to test-launch a new, upgraded prototype of an intercontinental ballistic missile. The United States has seen indications that North Korea may be preparing for a new missile test-launch in the coming days or weeks, U.S. officials said on Thursday, in what could be an early test of President-elect Donald Trump's administration. South Korean media, citing intelligence agencies, said Pyongyang may be readying a test of a new, upgraded prototype of an intercontinental ballistic missile (ICBM) as early as Friday, the day Trump is inaugurated. U.S. officials, who spoke to Reuters on condition of anonymity, cautioned however that they did not have such precise information about the range or potential timing of Pyongyang's missile test, should it happen. One official suggested Pyongyang could be largely seeking to provoke the Trump administration. North Korea leader Kim Jong Un smiles as he visits Sohae Space Center in Cholsan County, North Pyongan province for the testing of a new engine for an intercontinental ballistic missile in this undated photo. In his New Year's speech, leader Kim Jong Un said North Korea was close to test launching an ICBM, and state media has said a launch could come at any time. Experts on the isolated and nuclear capable country's missile program believe the claims to be credible. Trump on January 2 tweeted, “It won't happen!” about North Korea's pursuit of a nuclear-tipped ICBM, although his precise meaning was unclear. The Pentagon has said it would not necessarily strike a test-launched ICBM if it did not pose a threat. The Pentagon declined comment on its intelligence about the North Korea threat, but spokesman Peter Cook assured reporters that Washington's readiness would be not be diminished during the U.S. presidential transition, due to take place on Friday. 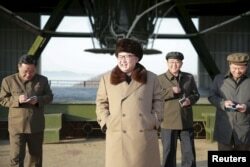 South Korean intelligence agencies reported on Wednesday that they had recently spotted missile parts being transported, believed to be the lower-half of an ICBM, raising fears that a test-launch may be imminent, the Chosun Ilbo newspaper said, citing unidentified military sources. “It was different from a conventional Musudan missile in its length and shape,” the source told the Chosun Ilbo, referring to the Musudan intermediate-range missile tested by North Korea last year. “It is possible they were moving it somewhere for assembly,” the source said. A spokesman for South Korea's Office of the Joint Chiefs of Staff, Roh Jae-cheon, told a regular news briefing that while the reports could not be confirmed, the military was monitoring North Korea's ICBM development. North Korea has in the past paraded mockups of a road-mobile missile believed to be an ICBM design dubbed the KN-08 by outside observers. It is also believed to have an upgraded version, the KN-14. A road-mobile ICBM, which could be kept hidden or moving until fired, would make tracking and stopping a North Korean missile launch significantly more difficult. The suspected ICBM is made up of two parts under 15 meters (49 feet) long and is shorter than the KN-08 and KN-14, the Yonhap News Agency said, citing unidentified military sources. “It's also possible that they are simply conducting field exercises with no plans to launch, or the option to launch if decided,” said Pollack. Last year, North Korea conducted a test of an ICBM engine made up of a cluster of smaller rockets, indicating it was working on an ICBM design. Separately, the Washington-based think tank 38 North said on Thursday that operations at North Korea's Yongbyon nuclear facility may have restarted. North Korea is believed to be able to reprocess plutonium at Yongbyon used in its nuclear warheads.